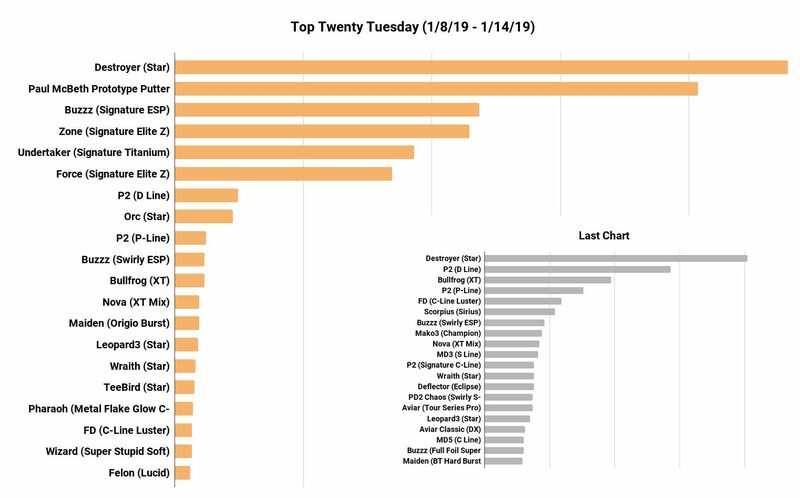 Infinite Discs is happy to present another Top 20 Tuesday chart, looking back at the discs that sold the most during the last week. We break these charts down by plastics as well so you can see which plastic types are most popular for each disc. New discs will often spike in the chart as other top sellers shuffle spots. It can be fun to see which discs keep up the pace. It is easy to see what ruled the charts this week. The Star Destroyer held onto the #1 spot with the release of the Ricky Wysocki Signature edition, which also helped to renew sales of the McBeth signature edition (folks now see an end coming to that supply). Paul McBeth successfully boosted Discraft to the next five spots on the chart, with sports 2-6 going strongly to his new signature edition discs. His prototype putter took the #2 spot as it is a limited run, and we now know that it will be called the LUNA upon stock release. Other popular discs stayed on the chart, like the P2 in a couple of different plastic types as well as a healthy does of Innova drivers in Star plastic (Leopard3, Wraith, TeeBird, and Orc). Jumping into the top 20 this week we find the Wizard in Super Stupid Soft plastic and the overstable fairway driver, the Felon in Lucid plastic. 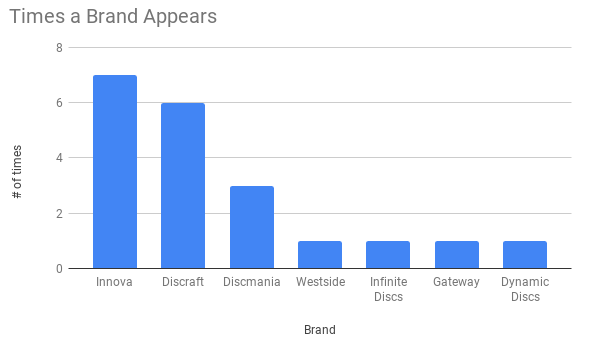 Here is a chart of how many times each brand appeared in the Top 20. WINNER – Three people won this week by guessing that the D-Line P2 would drop to the #7 spot. Congratulations to Robert, Clint, and Jason! GIFT CARD PREDICTION FOR NEXT WEEK: Leave your comment below this blog to predict the #12 spot for next week’s chart. Origin burst Maiden for #12. XT Bullfrog for the #12 spot. Star orc will drop to 12!